Die CST100 von Campbell Scientific ist ein automatisches Datenerfassungssystem speziell für CST (concentrated solar technology) - Anlagen. Die Standardausführung erfüllt CaISO EIRP Anforderungen und kann problemlos an Kundenwünsche angepasst werden. Typische Anwendungen sind Erfassung von Recourcen an einem Standort und Performance Überwachung wo Strahlungsmessungen notwendig sind. Is the CSP100 only used for power performance? Can it be used for resource assessment? The CSP100 can be used for both resource assessment and power performance. 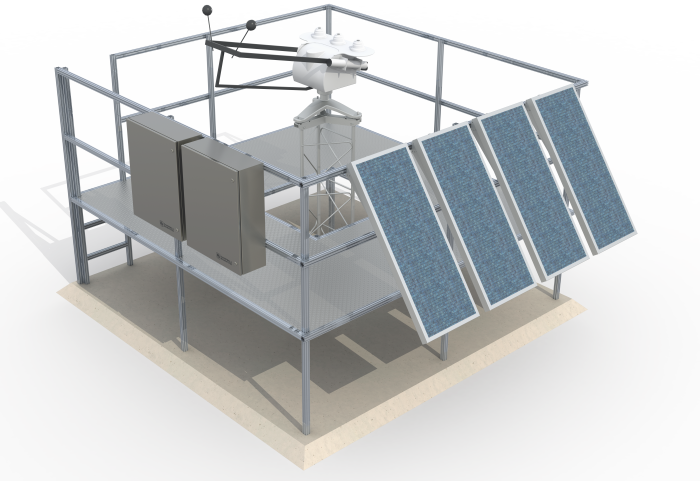 If the system will be used for resource assessment, the following items are needed: a dc power supply, a solid foundation for the tracker stand, and, perhaps, a general meteorological sensor stand. Note: The solar tracking component of the CSP100 requires a rather high power draw for remote use (>15 W when powered with Vdc, >21 W when powered with Vac, and potentially up to 100 W). What is the difference between the CSP100 and the Solar1000? Unlike the Solar1000, the CSP100 is intended as a system to measure direct normal irradiance (DNI). DNI is solar radiation that comes in a straight line from the direction of the sun at its current position in the sky. DNI is important for concentrated solar power, concentrated photovoltaic (CPV), and solar thermal systems. The Solar1000 is intended to be used for traditional photovoltaic technology. How much maintenance does the CSP100 system require? While the trackers Campbell Scientific uses can vary in their maintenance needs, all the trackers are fairly maintenance free when compared with the solar sensors. The solar sensors should be cleaned daily—at the minimum, weekly. The required maintenance cycle varies based on location, precipitation, and biologic activity.